We do not accept referrals. 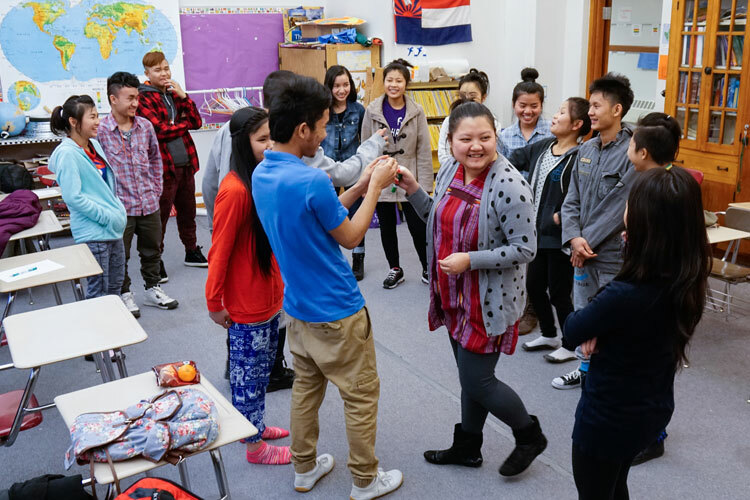 Students in KOM’s youth program are all refugees from Burma who have lived in the U.S. less than 3 years and have never been enrolled in KOM’s Youth Program previously. ကိးနံၣ်ဒဲး ကညီကရၢမံၣ်နံၣ်စိထၣ် မၤသကိးတၢ်ဒီးဝ့ၢ်စ့ၣ်ဖီလ်ပဒိၣ်ကၠိ (Saint Paul Public Schools) ဒ်သိးကမၤ ဂ့ၤထီၣ်အါထီၣ်ပှၤကညီဖိ ဒီးပှၤဘၣ်ကီဘၣ်ခဲကၠိဖိအဂုၤအဂၤခဲလၢာ်အဂၤ (၁၅၀) အတၢ်ဖံးလိမၤဒိးအဂီၢ်န့ၣ်လီၤ. ကညီကရၢမံၣ်နံၣ်စိထၣ်အပှၤမၤတၢ်ဖိဘၣ်ဃးသးစၢ်တၢ်ဂုၤထီၣ်ပသီထီၣ်တဖၣ် မၤသကိးတၢ်ဘူးဘူးတံၢ်တံၢ်ဒီး ကၠိ သရၣ်/မုၣ် သ့ၣ်တဖၣ် လၢတၢ်ဟ့ၣ်တၢ်မၤစၢၤလၢတၢ်ဖံးလိမၤဒိးအပူၤ, တၢ်မၤစၢၤလၢ နီၢ်ခိဒီးနီၢ်သးအတၢ်ရ့လိာ်ဘၣ်ထွဲလၢအမုာ်ဝဲ, ဒီးမိၢ်ပၢ်အတၢ်ရ့လိာ်ဘၣ်ထွဲဆူတီၤခၢၣ်သးဒီး တီၤထီကၠိဖိသ့ၣ်တဖၣ်န့ၣ်လီၤ. ကညီကရၢမံၣ်နံၣ်စိထၣ် ဟ့ၣ်စ့ၢ်ကိးတၢ်သိၣ်လိ ဘၣ်ဃး တၢ်သ့ကဲခိၣ်ကဲနၢ်အတၢ်မၤလိ, ဆူၣ်ချ့ပီညါတၢ်မၤလိတဖၣ်, ဒီးတၢ်ဟူးတၢ်ဂဲၤဘၣ်ဃး တၢ်ဆဲးတၢ်လၤ လၢပှၤသူၣ်ဘီၣ်သးစၢ်သ့ၣ်တဖၣ်လၢ တၢ်မၤအီၤဟါခီကၠိပျၢ်ဝံၤအဆၢကတီၢ်န့ၣ်လီၤ. တၢ်လၢခံကတၢၢ်တမံၤမ့ၢ်ဝဲ ကညီကရၢမံၣ်နံၣ်စိထၣ် ဟ့ၣ်နီၤလီၤတၢ်ကိၢ်ခါကတီၢ်တၢ်ရဲၣ်တၢ်ကျဲၤဒီးသးစၢ်ဒီးအပှၤဟ့ၣ်ကူးဟ့ၣ်ဖးတၢ်အတၢ်ရဲၣ်တၢ်ကျဲၤ (youth mentorship program) လၢပှၤကၠိဖိသ့ၣ်တဖၣ်အဂီၢ်န့ၣ်လီၤ. ၂၀၁၆-၂၀၁၇ တၢ်မၤလိနံၣ်အကတီၢ် ကညီကရၢမံၣ်နံၣ်စိထၣ် မၤသကိးတၢ်ဒီးကၠိယဲၢ်ဖျၢၣ်လၢအမ့ၢ်ဝဲ Battle Creek Middle School, Harding High School, Humboldt High School, LEAP High School and Washington Technology Magnet School သ့ၣ်တဖၣ်အဂီၢ်န့ၣ်လီၤ. ကျိၣ်စ့တၢ်မၤလၢတၢ်ရဲၣ်တၢ်ကျဲၤအံၤအဂီၢ်ဟဲခီဖျိလၢ တၢ်ဆီလီၤပာ်လီၤလီၢ်အိၣ်ဆိးတၢ်ရဲၣ်တၢ်ကျဲၤဝဲၤဒၢးဖဲမံၣ်နံၣ်စိထၣ် ပှၤဂ့ၢ်ဝီအဝဲၤကျိၤ (Resettlement Programs Office of the Minnesota Department of Human Services) န့ၣ်လီၤ. KOM partners with Saint Paul Public Schools to increase student learning of 60-150 Karen and other refugee students every year. KOM’s youth development coordinators work alongside teachers to provide academic support and parent engagement to middle and high school students. KOM also teaches leadership training, health education, and cultural activities to youth during after-school programming. Lastly, KOM offers summer programming and a youth mentorship program for students. During the 2017-2018 school year, KOM is working in two schools: Harding High School and Humboldt High School. During the 2016-2017 school year, KOM worked in five schools: Battle Creek Middle School, Harding High School, Humboldt High School, LEAP High School and Washington Technology Magnet School. Contact Moses Moe, Youth Program Manager, to learn about KOM’s youth programs and services. Funded by the Mardag Foundation and the Resettlement Programs Office of the Minnesota Department of Human Services.